For more advice on fishing the Lower Sacramento River Fly Fishing, check out the books below. Posse Grounds - Landing A "Bad Boy"
Below we interview three experts on Cailfornia’s Lower Sacramento River—Michael Caranci (The Fly Shop), Shane Kohlbeck (Lower Sac Trout) and Chris Parsons (The Fly Shop affiliate). In addition to picking up valuable advice, be sure to read Chris’ stories—about a cigar hater, a riverside conflagration and the travails of guiding. Question 1 - What sets the Lower Sac apart from other rivers? What really sets the Lower Sac apart from other rivers, to me, is it's diverse season. The temperate climate of the Central Valley, combined with it's low elevation (approx. 450 ft above sea level) makes for a 365 day season on the Lower Sac, and during the course of each year, and even throughout different seasons, the river wears many different faces. Anglers who fish the river at different times of year will recognize certain features, but in general it's almost a different river every time you launch your drift boat. Summer is a time of high flows (for Central Valley Irrigation) and hot weather, with a lazy summer feel to it accompanied by the occassional recreational rafter and boater just out enjoying the river. The river characteristically fishes poor in the cool morning, with the action picking up as the mercury rises, culminating with a brief flurry of dry fly caddis activity right before dark. The fall is the most popular time of year on the river, with flows dropping to wade-able levels and the frenzy accompanied by salmon and steelhead in the river, and the trout getting equally frenzied to gorge themselves on salmon eggs. Before long fall turns into winter and you generally have the entire river to yourself. Nymphs, eggs, and even BWO dries are the norm on overcast, drizzly winter days. Spring is the biggest gamble each year, with flows ranging from 3,000 cfs to 30,000 cfs depending on how wet the winter has been, and daytime temps ranging from snow to mid-80s. You never know what you'll get in the spring, except that if you hit it right you'll see the best fishing, and best hatches, of the entire year, making it worth the weather risk. Every day is different on this river, and every drifted fly has the potential to hook the biggest trout you'll ever see. In my opinion, the Lower Sacramento River - from it’s origin at Keswick Dam down to the town of Red Bluff - is at the top of the list of California rivers when it comes to fishable days per year, overall size and quality of fish, and overall numbers of fish hooked per day on average. On any given day when conditions are halfway decent it’s not uncommon for two anglers to have more than a couple dozen opportunities at wild trout in the 16-20” range. The river offers multiple ‘seasons’ if you will. From low, clear water of winter, which is easily navigated by the wade angler, to higher summer flows of over 12,000 cfs at which time one is limited to fishing from boat. We have hatches of insects every month of the year, with the spring and summer seeing the peak of the bug activity. Caddis, BWO, Midges, and PMD are the mainstays with stoneflies also showing in spring. The months of October, November, and December offer anglers the opportunity to target big rainbows feasting on salmon eggs, as thousands of Chinook Salmon spawn in the upper 15 miles of river. It’s somewhat “Alaska-ish” at times. The Lower Sacramento is such an easily accessible river for anglers coming from Sacramento, San Francisco, Fresno, San Jose and all the other great cities in California! Make the Lower Sac your only destination or the first in a series of rivers that no doubt could include the McCloud, Pit, Hat Creek, Fall River or the Trinity, all within two hours of Redding, CA!. Some of the very best angling found in the west is located in the heart of Redding, CA. Redding is just such a great town offering a diverse selection of quality restaurants, entertainment, hotels and attractions like the famous Sun Dial Bridge and Turtle Bay Exploration Park! With The Fly Shop located only minutes from boat ramps, riffles, caddis hatches and wild rainbows that average 16", the Lower Sacramento River is practically the perfect fly fishing getaway for any angler coming from all points USA! When it comes to fly fishing, no other river in the west compares when it comes to consistency 365 days a year. The best time to fish the Lower Sacramento is when you can get here! Question 2 - What is your favorite hatch or time of year to fish the Lower Sac, and how can people be successful at this time? My favorite time of year to fish the Lower Sac is actually in the dead of winter, December through February. There's almost no one on the river at that time, so you have the fishing almost entirely to yourself most days. You may not catch as many fish as other times of year, but you seldom see small fish (average winter rainbows are 17-20"). And if you hit the river on a drizzly, overcast day, you can expect baetis (blue-winged-olive mayfly) hatches and midday rising fish, too. My favorite time of year to fish the river is basically whenever I can get out. For me, fishing from a stationary position is hard to beat. Wade fishing when salmon are spawning in Oct/Nov, or anchoring up in riffles during late spring when PMD and Caddis are popping at the same time is pretty hard to beat. The fish tend to stack up in some areas. I’ve had days where 25 casts resulted in 23 hook-ups. In the same riffle!! If I had to pick a favorite time, I would have to go with the late summer days of August through September for the consistent caddis hatches, big rainbows and evening dry fly fishing! It's nice be out on the river, in town, fishing close to home, friends honking at me while they drive home from work yelling "get a real job"! Beyond that, the Lower Sacramento offers consistent fishing all year long! Really, my favorite time on the "Sac" is when you are here fishing it with me! I know, I'm shameless, but the Sac does offer good to great fishing all year!The key to success on the "Sac" is a drift boat and a selection of flies that could include #14 Fox's Cinnamon Poopah's, #16 Zack's Pseudo Nymphs, #14-16 Mercer's Micro Mayflies , RK Flatulators and the one and only Pat's Rubber Legs in #6-8. If you choose to fish with a guide, The Fly Shops guide staff are on the river everyday except when the winds are blowing out of the south at 50 mph! Then we go to a selection of plan "B" spots. It's a plus if the drift boat is in the water, floating, with someone rowing it while you fish. Question 3 - What is the most memorable thing that ever happened to you or someone you know on the Lower Sac? My most memorable Lower Sac experience was the one that got away. I was guiding a group in late October and one of the gentleman hooked a monster steelhead. At point point the fish jumped right next to the boat so we had a good look at it, and I'd estimate at close to 20 pounds. Only problem was it was on a 5 weight rod, and we never had a chance. I'll never forget the vision of that giant fish jumping one more time, literally silhouetted against the sunset about a quarter mile downstream of the takeout and the line going slack. I've never been a fan of 5 weight rods on the Lower Sac ever since! Having spent somewhere around 2000 days on the river, I’ve seen some memorable things. The extremely exotic Mandarin Ducks that migrated thru were a highlight one winter. Bald Eagles and fish-swiping Osprey are always present, as well as the occasional Bobcat. Once in a while I see what I call “town bucks” around – big deer living a safe life in and around town. Some days get a little exciting, like when I had to rescue some anglers who’d flipped a drift boat on a bridge pillar, or the time I called 911 when a kid had fallen, and was stuck hanging on to a root ball halfway down a 150 ft. steep bluff that plunged straight down. That was a little hairy… Then there was the day my client had a seizure… not exactly what I had signed up for but things ended up alright. Question 4 - What general advice can you give people considering fishing the Lower Sac? See as much of this river as you can, in as many different seasons and conditions' it'll never stop amazing you. From time to time I hear people complain about how it's "only bobber fishing" or they "don't like fishing in town". This just tells me they haven't fished the river in March when the brachycentrus caddis are all over the place, or drifted the scenic wilderness sections south of Anderson. My first piece of advice when people ask about learning how to fish the Lower Sac is to hire a guide for at least one day. I learned the river on my own, with no coaching. It took months, if not years, to learn how to do it the ‘right way’. By hiring a guide, you can see how “the pro’s” do it, learn the proper type of water to fish, how to rig an indicator/nymph set up, choose the right flies, and usually get some nice fish in the net while doing it. After that one day, an angler can wade fish the river, or float in his own boat, and will most likely be successful. Overall, it eliminates days of what usually ends up being extremely frustrating, expletive-filled, trial and error time on the water. Use one or two SSG (1.6g) shot if you are wading and fishing nymphs under an indicator. Leaders and tippet should be no less than 4X for nymphs. I use 3x when wading cause the "big-bows" will break you off when they tear out into the very fast current should you use lesser tippet size and strength. 4X-5X is okay for dry flies. If you do wade the Sac, make sure the flows are sub 5,000 cubic feet per second and wear a PFD. It's very wise to check in with the staff at The Fly Shop before wading out into the river. Experienced advice from the friendly and knowledgable staff at The Fly Shop can easily steer you to the most productive and accessible riffles and runs between Redding and Red Bluff. A 9' 6 weight rod is a good standard for the sake of the big indicator and heavy weight that has proven to be the most productive method when getting the flies in front of the wild rainbows. The very best way to fish the Sac is out of a drift-boat. I think I said that. Question 5 - Is there anything you'd like to share about yourself or your company? The Fly Shop's guides wrote the book on the Lower Sacramento River, and still add new chapters every year. The closest boat ramp is less than a mile from the door of our shop, and we literally have guides on the water every day of the year, sharing information and working together to make sure that all of our angling guests enjoy their experience on the river. Check out our website at http://www.theflyshop.com/adventures/lowsac.html for more information, or give us a call at 1-800-669-3474. What sets me apart is that I tend to teach and explain things when I’m guiding. I don’t just row downriver and say “Fish here” Knots, rigging, fly choices, casting techniques and fish fighting techniques are all going to be discussed at one point or another during the day when I’m on the oars. When I say “Cast left side”, it’s usually followed by an explanation of why we’re fishing that particular side of the boat, so my clients learn to understand how to recognize the best fish-holding water as we drift downriver. In the end, I try my best to make sure my clients come out of the day a better angler. We have some fun and catch some fish while we’re at it. The Lower Sac is California's biggest trout stream, and its rainbows are commensurately sized (see picture of 30" native rainbow below, courtesy of The Fly Shop). If you want big fish and year-round fishing, try this river. With a smorgasbord of food (2,500 insects per square foot of river), the average fish grows to a satisfying and hard-fighting 16", and whoppers ranging over two feet are not out of the question (bring some heavy gear...). The fishing season is year-round, and water temperatures remain fairly constant, as the river emanates from the bottom of Shasta Lake (drainage of such blue ribbon fisheries as the McCloud, Upper Sacramento, Pit, and Fall Rivers and Hat Creek). As if a healthy trout population were not enough, the Lower Sac also boasts runs of Steelhead and Chinook salmon. However, because the water is warmer than than the mountain streams to its north, the Lower Sac also holds populations of shad, squawfish, stripers and largemouth and smallmouth bass. Highest flows are during the summer, when a drift boat is recommended (there are six launch pads). Wading is possible around riffles during high flow, and across much more territory from fall to spring. Access is fairly easy from Interstate 5, which parallels the river. Another bonus: The Fly Shop is located in Redding, at the top of this great 25-mile stretch. 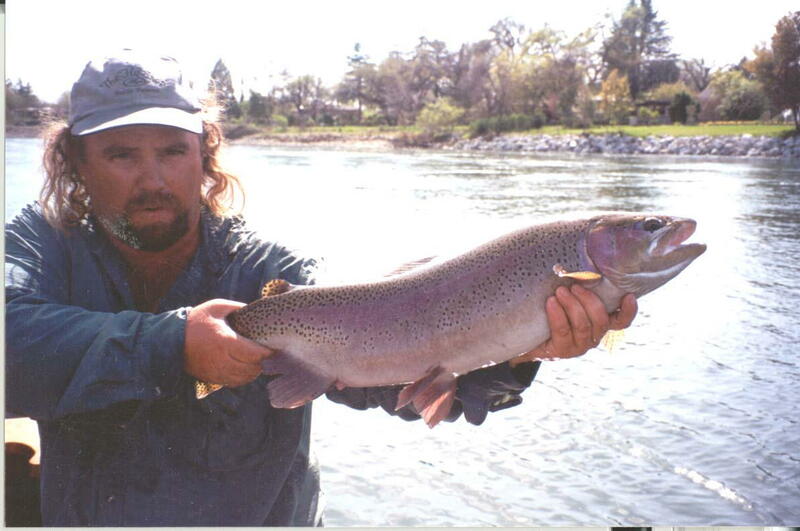 The Lower Sacramento is big tailwater with big, powerful rainbows. The water consists of long, featureless, spring creek-like stretches that are broken up by long riffles, deep pools, gravel bars and islands, many of which are more prevalent during low water. Due to the river's size and the frequent private property along the banks. Those who prefer to wade have two options: fish from public parks and access points in the 16 miles between Redding and Anderson or, from your boat, get out at the riffles and take some casts. Click here to get driving directions to the town of Redding. Check out the official regulations. The river is open year-round. Summer can be extremely hot and dry, with temperatures over 100 degrees (though the water remains fairly constant in the 50's and provides welcome relief for those who wade). Fall and spring are mild, with some rainfall. Winter is not cold (highs in the 50's and 60's), though rain is common. Highest flows are in summer, when water is discharged from Shasta Lake for irrigation and hydroelectric power. Caddis and salmon eggs are the top items on the trout's menu. From March through September, caddis abound, with the high point being the April "Blanket Caddis" -- a hatch so prolific that it seems to cover ("blanket") the entire surface of the river. In between hatches, nymphing the riffles can be productive. In fall and winter, trout gorge on the eggs of spawning salmon. There are no fly fishing only sections, though the upper section from just below Keswick Dam to the Deschutes Road Bridge below Anderson requires barbless hooks. For more advice on when and how to fish, contact The Fly Shop, check out the books and other fly shops below. You may also want to browse the official regulations and The Fly Shop's fishing reports before you leave. We appreciate your input on this page. Please e-mail us. Troutsource highly recommends the services of a local fly fishing guide. We've listed the best ones below, and you can contact all of them at once using our e-mail form. A guide can be the difference between getting skunked and catching 20 fish. Remember, getting the right fly is only half the battle. You need to know exactly where to put it, and how -- and this is where guides earn their money. A customary tip is 15%. Get conditions and guide availability from participating shops. Simply fill out this brief form and they will contact you directly! View the list of fly shops you can contact.